Dr. Rebecca McCulley of the University of Kentucky, Dept. 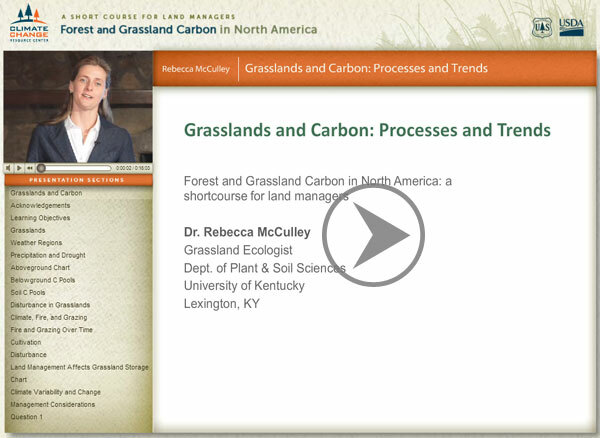 of Plant & Soil Sciences, talks about grasslands and the way they store and process carbon. Grasslands make up about 30 percent of the North American surface. Grasslands differ from forests in many ways, but from a carbon perspective they store a much greater proportion of the carbon than they take in in any given year in belowground components (roots and soil carbon pools). The best way to manage grasslands for carbon is to get the carbon below ground and keep it there. Disturbances such as drought, fire, grazing, and tillage are important in grasslands and can ultimately determine the carbon balance of these systems.